Habaki : Single silver Habaki. Blade length : 29.8 cm or 11.73 inches. Width at the hamachi : 2.79 cm or 1.09 inches. Shape : wide and thick Tanto. There are engraving on both side of the blade. Hamon : Nie Deki, Gunome Midare and Choji Midare. Special feature: Sakai Ikkansai Shigemasa was borne at Shizuoka prefecture and moved to Saitama prefecture. Doryokusyo prize 3 times Nyusen prize 4 times. from Taisho 10th and create his own business at Showa 7th. Finally he became Mukansa sword maker. During war time, he made swords at Nihonto Tanrenkai. Saya : Black Fuemaki Saya. Tsuba : Shakudo Mokko shape Tsuba. Menuki : Person is engraved with gold and silver color. Fuchikashira: Shakudo, box is engraved with gold and silver color. 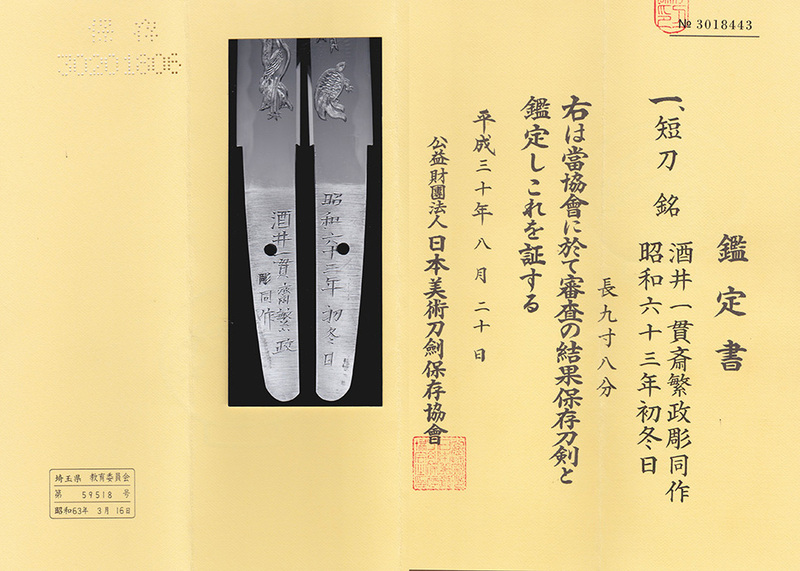 Kozuka: Shells are engraved with gold and silver color. From Aoi Art:Sakai Ikkansai Shigemasa was a Mukansa sword smith. He is good at engraving. This engraving is so nice. There is Ububa on the blade. We recommend this Tanto for you.